Well, what a way to start the New Year !!! Truly amazing. Some of us may be waking up with a headache on January 1st but for our small group of eight, I know it won’t be due to overindulgence the night before. Many report the telltale signs of mild altitude sickness at this point – headaches and nausea– but that’s not entirely unexpected. I should mention that Tusker has an exceptional record for monitoring not only its climbers’ progress but also their vital stats twice a day. Low oxygen saturation levels are a warning sign that the body is not adjusting well. I know how tricky that can be. When I was recovering in ICU from pulmonary embolism (blood clots throughout my lungs), my oxygen levels were very low and I could not be released until my oxygen readings approached normal levels. I tried to get an extra “hit” of bottled oxygen immediately before the next reading in the hospital but despite best efforts my levels were too low to get the green light and the opportunity to be discharged. I was adamant that there must be an equipment error until the very sly student nurse tested her own reading and found an almost perfect 100% oxygen reading. Busted!!! I’m sure the Tusker crew will be equally diligent. 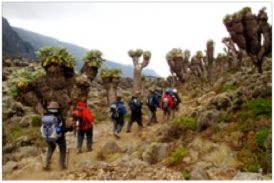 After an oatmeal breakfast on January 1st, we will hike east across the Shira Plateau past the Shira Cathedral towards Moir Camp, tucked away at the end of a massive gorge at the foot of a giant lava flow. We will enjoy a hot lunch at Fisher Camp, only a couple hours from our destination. We also leave the Heather and Moorland at this section of the climb for the Arctic Desert. Rainforest 800-2800m: Drenched in heavy rains, this section remains lush and green year round. Colobus and Blue monkeys, the odd mongoose and lots of birds and insects can be found amongst the giant ferns, vines, juniper, fig and olive trees to name a few. On northern and western sides of the Kilimanjaro Park you may even be able to spot elephant and buffalo tracks! 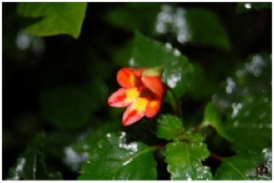 There are lots of endemic flowers too for you to look out for including violets, orchids and the famous Impatiens Kilimanjari! Heather and Moorland 2800-4000m: Known as the low alpine zone, you emerge from the forest into sparse vegetation. It can feel extremely fresh compared to the humidity of the forest, with temperatures getting down to 0C at times. Heather and shrubs blanket the ground and everything is much shorter due to this harsh environment. There are a few flowers to spot, but the most prominent feature is the Giant Lobelias, that grew like stubby palm trees! Unfortunately the only animals you are likely to see here are scampering striped mice and a few crows all foraging scraps of food dropped by passing Kilimanjaro trekkers! Alpine Desert 4000-5000m: A fairly inhospitable place, there is not much life in the desert apart from some tussock grasses and a few small flowers. It is brown, dusty and dry. With little to no shelter from the elements, intense radiation plagues the day and at night temperatures plummet to freezing. 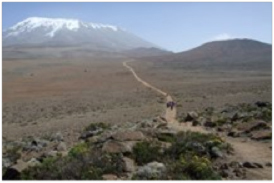 It is however a great part of the trek, as for the first time Kibo (Mount Kilimanjaro’s highest peak) and its summit come in to full view. 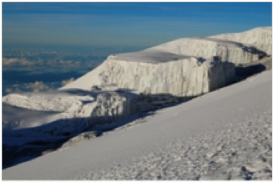 Summit Zone 5000-5895m: From the desert we trek into arctic conditions and where oxygen is nearly half that of sea level. With little to no surface water there is no life apart from lichens which cling desperately to rocks hoping for a few droplets. The sun burns during the day and at night the cold is ferocious. 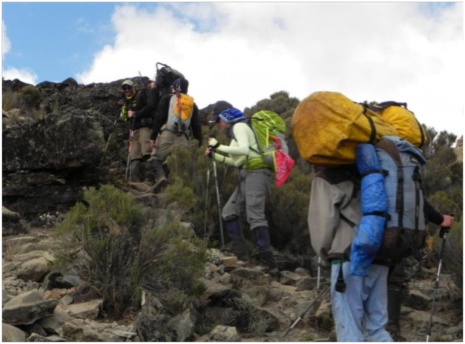 We are now experiencing the fragility of life and so waste no time in our Kilimanjaro summit quest.